US, 1972, 144 minutes, Colour. Jack Lemmon, Juliet Mills, Clive Revill, Edward Andrews, Giafranco Barra. The incidental jokes, remarks, satire and hilarious situations are marvellous in this romantic comedy that arises out of a lightly macabre situation to two people going to Italy to take home the bodies of parents killed in an accident. History repeats itself as the two become involved as their parents did which changes an objectionably priggish Jack Lemmon into a more humane person and given an attractively pudgy Juliet Mills some loving warmth. Clive Revill, excellently impeccable as the maestro of the hotel, presides over romance and intrigues diplomatically. The film is light, pretty in photography and music, challenging to accepted morals and conventional cliches (and it is a bit long). 1. 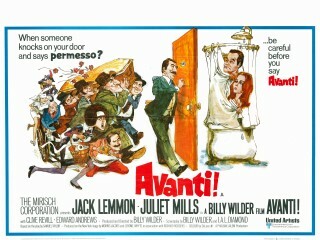 Avanti means come in. What did the Italian title suggest for the film? Did the title have any meaning for the film? 2. How comic a film was this? As a comedy of laughs? Why? As a comedy of situations? Why? As a comedy of characters? Why? As a comedy of insights into human nature and human foibles? Why? As a black ironic comedy? Why? Which aspect predominated? Why? 3. The importance of the colour, the music, the scenery? Did this tend to make the film rather lightweight? 4. The importance of the dialogue for the film ? the quips, the satire, the funny one liners, the remarks made in the situation, the satire on Americans, the English, the Italians? How successful was the film in the area of dialogue? 5. What was being satirised in the American character in the character of Wendell Ambruster? The significance of the opening of the film, his telephone calls, brashness etc.? What was being satirised about the English? Pamela's primness and properness? Phlegmatic aspects of the English temperament? What was being satirised about the Italians ? especially in the behaviour of Carlucci? In the character of the Coroner, the maids the servants etc.? 6. Wendell Ambruster: What kind of person was he in himself, how puritanical, how involved with money, his relationship with Ms wife, as a stock American rich businessman? The impersonal and brusque nature of his character? His being shocked to learn of his father's behaviour? What changed him? Did he become more humane through his encounter with Pamela? Why? Which sequences best illustrated this? Was he a better man at the end of the film? He would come back later? Was this a good thing? 7. Pamela: What kind of girl was she, even though pudgy was she an attractive character? The revelation of her past life, the attitudes that she brought to Italy? Her knowledge of her mother and her appreciation of her mother? Did she change during the film? What sequences best illustrated her character? The importance of the sequence where she mourned her mother? Did her character change and become more farcical as the film went on? Why did she fall in love with Ambruster? Would she be happy coming back to Italy every year? 8. Carlucci: How did Clive Revill's performance enhance the film? Which were the sequences which best illustrated his influence in the film? 9. Did the blackmail and murder distract from the tone of the film or were they in keeping with it? Why? 10. The importance of such comic sequences as the sequence with the Coroner, or the Nuns lining up to see "Love Story"? What impact did they have when they occurred in the film? 11. Joe Blodgett: what was being satirised here about Americans? How funny was this character in his influence? 12. How did the film use the conventions of comedy and love story and in some ways reverse them? Was it a good 'playing with' conventions? 13. The morality of the film - was it immoral or amoral? Was it in bad taste - a comedy based on people coming to take the corpses of their parents? Did the film lapse into bad taste? The whole puritan morality of Ambruster and his change? Was this immoral or amoral? 14. In view of the preceding questions, was the film a successful comedy? Why?